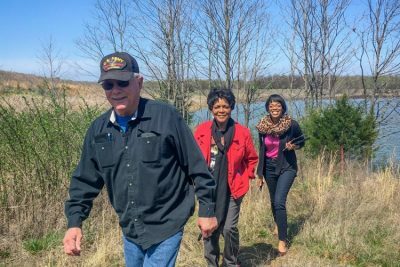 Featured image: Local activist Tim Tanksley (L) leads Oklahoma gubernatorial candidate Connie Johnson (center) and Johnson’s campaign manager, Charise Walker, to Bokoshe’s fly ash dump. On the edge of Bokoshe, population less than 500, sits a hill about 60 feet high, covered partly with soil. From a distance, it could be a natural part of eastern Oklahoma’s rolling hills. But this mound isn’t like the others: It’s made of toxic fly ash, a coal byproduct from electricity production, generated by power company AES. The fly ash fills in an unlined, abandoned strip mine at a site also used to dump wastewater from fracking. When it rains, the waste runs into nearby lakes and tributaries of the Arkansas River. “[The state] structured their research so they didn’t find anything,” Bob Sands, a veteran journalist now at OETA, tells In These Times. He explains that the state only looked at cancers linked to arsenic and chromium-6, not at those linked to other heavy metals found in fly ash. The problem, says Sands, is that the state’s original deal to bring AES to Oklahoma placed it under the control of the Department of Mines, not ODEQ. “A lot of the environmental problems we have [were] swept under the rug because of Scott Pruitt,” says Dana Bowling, 52, a resident of Longtown who came to meet Johnson and see the hill of fly ash. Before he was tapped for EPA chief, Pruitt, as Oklahoma’s attorney general, led an anti-regulation crusade that included eliminating his office’s Environmental Unit. The state has also given coal companies so many tax credits that it provides more state revenue to the industry than it collects, costing the state more than $60 million between 2010 and 2017. Valerie Vande Panne is an award-winning freelance journalist. She is the former editor-in-chief of Detroit’s altweekly, the Metro Times, and has covered Detroit’s alternative economies for Bloomberg.